Industry and society trends will affect all of us both on a personal level and a professional level. Creating a vision of the future for the Welder is one of the central aims of our e-zine, The WelderDestiny Compass. It is therefore obvious that we will spend quite a bit of time exploring the current industry and society trends to anticipate how these will affect the job of the Welder in the future. This web page is essentially a compendium of articles published in The WelderDestiny Compass that deals with industry and society trends. It assists those that want to follow our discussion regarding industry and society trends without having to actually read all the back issues of The WelderDestiny Compass. It will be updated every time we discuss industry and society trends. 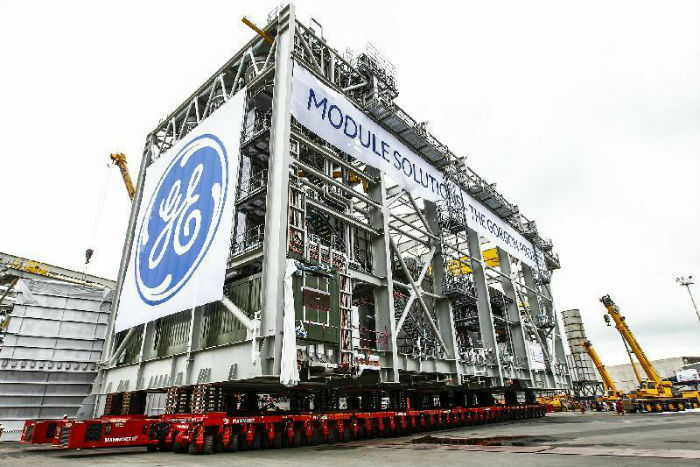 A Module For the Gorgon LNG Plant: This module was produced by General Electric as part of the Gorgon LNG plant. Modular plant construction is one of the new industry trends. - Acknowledgement to General Electric for the image. As you read the compendium of the industry and society trends articles within this page, please keep in mind that these articles also have reference to other articles within the same e-zine edition in which they were originally published. This may make the different articles below appear a little disjointed. If you would like to see the broader context of any specific article, please click through to the full e-zine to get a more complete picture. The other advantage of looking at the whole e-zine is that there may be supporting articles posted there by some of our readers, and their insights may just be what you are looking for. A number of companies are on the cusp of bringing out self-driving cars and trucks. 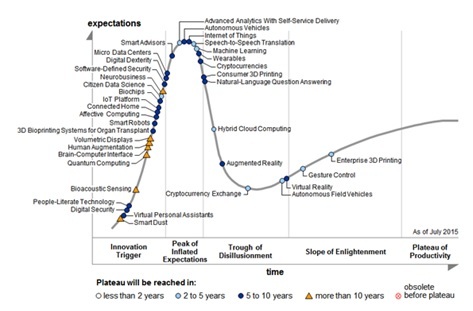 (The estimate for when this technology will “go mainstream” is about 5 – 10 years.) This sounds all science fiction like. You can picture in your mind how you go outside to your car, and tell it where you want to go. Then it takes you there while you finish applying your make-up or reading through your presentation, or whatever. In the bigger scheme of things, this picture is not that different to what we already have today. The only difference is that you do not have to do the driving yourself. But is this really how things will work in a world of self-driving cars? Let us for a moment think about “ride sharing” services like UBER. Now imagine that instead of a car with a driver coming to give you a lift when you "hail a ride", a driverless car pitches up to give you a lift. What implications will that hold for the entire transport industry? How easy will it now be for individuals to purchase a dozen or so driverless cars and have them shuttle people around a city day in and day out, using Uber as their business platform? How long will it take for people to realise that they probably do not need a car for their day to day transport needs, because there will be over enough driverless cars waiting around to take them wherever they need to go? How will this impact the business model of car hire companies? How will this impact the business model of public transport companies? (Busses, trains etc.) Obviously it will be diabolical for "professional drivers" such as taxi drivers and limo drivers. If the default way of getting around cities is to just hail a driverless car, rather than families using their own multiple cars that stand idle 80% of the time, then the productivity associated with cars will skyrocket. How will this impact the volume of cars sold by automobile manufacturers? The demand for higher end cars may totally collapse, if you have no real control over how luxurious the car will be that pitches up to give you a lift. Probably the only cars that private individuals will buy are those that confer extreme status such as sports cars, or specialist vehicles associated with specific pastimes, hobbies or jobs. How will this whole picture impact the business model of companies supplying parking lot services in cities? How will this impact companies operating toll roads? Considering the picture painted above, it becomes clear that the whole process of changing the basic transport paradigm will result in huge shifts of economic rent. (We will be addressing the concept of economic rent in a near future edition of “The WelderDestiny Compass”, so stay tuned!) There will be totally new industries established, and some industries or business models will be decimated. While we have explored just one of the paradigm shifts that could totally change our world, (driverless cars) these paradigm shifts created by "the rise of the machines" will be everywhere. In earlier, gentler times, those of us in engineering tended to see everything in terms of "creative input" to solve new problems. Every new problem required at least a new solution, if not an actual novel solution. This approach has been steadily changing over the past decade or two. Now a lot of engineering is the application of "modular" solutions. You want an LNG plant? Sure, we will design it in India, based on our proprietary technology, then build the modules in China and assemble it on site wherever you want it. Even this approach takes a lot of engineering manpower, with thousands of engineers needed to generate the necessary construction drawings and perform the necessary purchasing functions etc. to get to a point where an operating plant is standing. It also takes thousands of artisans to build the necessary equipment and install it as required. Once we reach the final stages in the commoditisation of engineering, things will look significantly different. A great deal of the equipment will then be manufactured under automated conditions. Many of the components that were previously welded constructions will be made through "additive manufacturing" processes. (3D Printing) In this scenario, the amount of human involvement in the whole design, project management and fabrication process will be cut by maybe 80% compared to that required today. So, what will the engineers and artisans (tradesmen) be doing in this new paradigm? Mostly they will be "teaching" the machines and computers how to do the work, and then “supervise” the machines and computers. Instead of designing a piping system, the piping engineers will be working in conjunction with the necessary computer programmers to develop the software that allows piping systems to be designed by the computer. As welding engineers we will be involved with "teaching" the computer how to develop welding procedures and the necessary NDT required to produce the piping systems designed by the computer. The artisans will typically have more of a supervisory capacity over the automated systems to make sure that they can deal with "non-standard" conditions encountered, and to optimise the production process. Within the paradigm described above, we see that there is actually an escalation in the skills required by the engineers and artisans. Not only will a welding engineer need to know how to develop welding procedures, but also how to interact with software to enable a computer to perform that function. Not only will a Welder need to know how to weld, (If you do not know how to weld, how can you set the machines properly, or know when something is going wrong?) but will also need to have skills such as computing, metallurgy, codes and inspection. We may ask ourselves if it is really reasonable to expect welders to have all these skills? To answer that question, let us make a short trip down memory lane. Twenty five years ago, finite element analysis (FEA) was a relatively new tool. It was typically used by specialists in their field. Mostly engineers and scientists with PhD's. Building an FEA model was a rather complicated process, and it was very easy to get it wrong. If you did not know all the fancy mathematics that the computer was using to solve the numerous equations to get an answer, you would in all probability end up with a totally garbage answer. Today the FEA applications are much more powerful and user friendly. Now a reasonably "standard" engineer can do a relatively short course on FEA and do some really amazing stuff. Has the quality of engineers increased that much? No, the quality of the FEA software has increased that much! We often hear the term “the sharing economy” used to describe businesses such as AirBnB. The reference seems obvious. People are able to share their home with others for mutual benefit. The home owner gets some income while the person renting the room on a short-term basis gets a cost-effective accommodation solution. These types of businesses really are just a more popular incarnation of what is traditionally known as “arbitrage businesses”. An arbitrage business looks for an inefficiently used or priced good or service, and “captures” the costs associated with the inefficiency, by increasing the efficiency. If we look at privately held assets, then we often see the greatest inefficiencies. Many households have 3, 4 or 5 bedroom homes, but only use 1 or two of those rooms on a regular basis. This means that there is at least a 50% inefficiency in accommodation utilization in most Western style cities or towns. By establishing a mechanism (or platform) to overcome the barriers that have prevented people from better utilizing the additional space in their homes, AirBnB could arbitrage away some of this inefficiency. What value was created by the arbitrage platform called AirBnB? The Hilton hotel group is valued at $23.33 billion. It was established in 1919. The Hyatt hotel group is valued at $6.87 billion. It was established in 1957. AirBnB is valued at $30 billion. AirBnB was established in 2008. In the space of under 9 years, the value available through the arbitrage of efficiency of private homes is as great as the combined market valuations of two of the world’s greatest hotel groups that have been in operation for 50 and almost 100 years respectively. The internet is essentially a communication mechanism. Any inefficiency that has been created by an inability to communicate on a very intimate level, can technically be eliminated by using the internet. If we start thinking about things that we often have to do repeatedly, purely because the necessary communication platform is not in place, we can immediately see huge potential for many more businesses based on this arbitrage model. Especially in the welding industry there are big money wasters due to information being “quarantined” within organizations. With the correct platforms, huge amounts of value can be unlocked. As there are some of the stakeholders that benefit from the inefficiencies, there will always be resistance to the removal of the inefficiencies. It is however important to note that the more efficient human labour becomes, the lower the economic incentive to replace this labour by machines. One arbitrage area that is currently growing tremendously, relates to platforms for bringing together people who want short term jobs, with people or organizations that have short term positions to fill. This has resulted in a marketplace where more and more people are relying on this “casual” labour model. The official labour statistics show that a much greater proportion of work is presently being done on a casual basis than was the case in the past. It is important to note that it is not only menial labour going down this path. Anything from computer programmers, writers, accountants and Welders are going down this road. In the early days of the internet, the term “surfing the internet” was very apt. If you wanted to find some information about welding, then you would start at one of the internet “hubs” like Yahoo or AOL, and poke around till you found some kind of web page where people would link to websites that dealt with welding. Once you started following those links, you would get to other websites that had further links etc. You never knew where you would end up. It was like surfing an information wave, until you finally found the information you were looking for. Quite often you would spend hours looking, and not finding anything. The introduction of the search engines changed everything. Suddenly it was a much simpler task to search for information. The earliest search engines were not that great, but Google changed that. It was simple, quick and effective. Google has a stock market value of around $500 billion. Actually, that is Alphabet’s value, but we won’t get too technical here! Where does Google make its money from? Principally advertising, right? So, what is Googles product? Some people may say it is “search”, but seeing as I don’t actually pay to do my searches, that could not really be their product. Is it the information they provide me with when I do a search? Not really, because that information comes from other people and businesses. So, what is Google’s primary product? It is you and me, the users of their search engine. When they sell advertisements to their clients, they are indirectly selling what they know about us, as inferred from our search history, so that their clients can sell stuff to us. We are Google’s product! There are many different technologies that come together to give us the internet. Everything from computer hardware to fibre optic technology to software such as browsers. These technologies have enabled many organisations to provide internet services, but the big value is added by platforms such as Google, Facebook, LinkedIn and many others. These platforms aggregate the data at their disposal, and through data mining and manipulation create products to sell. But, in essence, we the users of the platform, is the product. While the technology enables, the platforms empower! When studying my materials engineering degree, I was not greatly exposed to codes or standards. I kind of knew that there were such things, but we were more concerned with the basics of why materials behaved the way they do. As a young engineer, my hubris was rudely interrupted when the use of, and the compliance with, codes and standards were mandatory. Suddenly my world was restricted and regulated. It was also guided so that the risk associated with my mistakes would be limited. One of my early mentors, an experienced welding engineer, explained the role of standards to me in the following light: Codes and standards are the pinnacle of engineering, because within them they have distilled all the experience, knowledge and insights gained by generations of engineers. Being a bit of an anti-authoritarian type, this did not sit well with me. Over time I have however come to accept that codes and standards play a very important role in setting engineering standards, and communicating important design assumptions and information down to the shop floor. Without relevant standards, the lines of communication, and the fundamental design assumptions would have to be re-established for every project. This would significantly increase the risks associated with building and operating hazardous equipment and installations such as we find in the oil and gas, power generation, aerospace, building construction and a host of other industries. Clearly, there is a role for codes and standards in the welding industry. After gaining some experience, I ended up being nominated to serve on a few standards committees (or were they working groups – I forget) of the South African Bureau of Standards. (SABS) The company I was working for at the time asked that I get involved. As part of my "induction" to becoming a member on a standards committee, I attended some introductory presentations. Obviously, the systems and structure of the standards body was explained, but the question was also posed to all those present: What is your central role on the standards committee? There were rather noble answers such as contributing technical knowledge, providing knowledge leadership, personal growth and numerous other answers that were equally noble. We were told that those were the wrong answers. We are there to represent the interests of the companies and organisations that sent us there! In short, standards are just as much about looking after your own interests and protecting your own turf as it is about the health and safety of society! The suppliers are there to try and give their particular technology an edge over those of competitors. The end users are there to try and put such great restrictions in place that it serves as a barrier to entry for competitors. As a general rule, the "little guy" and the "small business" is not represented. If we keep in mind that many of the codes and standards associated with the welding industry end up being referenced as part of legal regulations, then it becomes clear that the codes and standards are used as a mechanism by bigger organisations (and organisation bodies) to gain an edge on their competitors and to introduce barriers to entry for small businesses that could capture market share from the entrenched operators. For standards that are used across international boundaries, the stakes are even higher. By placing well targeted requirements in the codes and standards, one country can effectively advantage their own national industries above those of other countries. Another problem that has started to rear its head is that the review process for these standards are so time consuming and cumbersome, that they tend to lag the latest technological innovations being introduced. This problem is going to get much worse in the coming decades. Given that welding codes and standards are indeed needed, but that there are moral, structural and schedule problems with the current way of doing things, we seem to have a catch 22 situation. How could we possibly solve this problem? Taking a stab at how this could potentially unfold is a bit of a risk, as there are so many different interests and players with great political power, that it really is unpredictable. We can however think of a potential framework. Many organisations within the software industry have decided to move to an "open source" model for developing their platforms. I believe that a future where information and knowledge is freely available, the open source model for developing codes and standards holds much promise. The downside of open source is that the product is essentially free, so it is not possible to make money selling the final product. The code or standard in this case. The upside of the open source model is that there are a lot of people that provide their time for free to help develop the product, so it does not cost the standards organisation much to develop. This would not be much different than the current situation I may add! There are a number of models for making money from operating open source development environments. In our case, we could visualise a standards organisation that operates an open source standards development process in conjunction with a professional "social media" / "marketing" platform. Imagine if LinkedIn developed a standards development arm through which their members could participate in standards development in a "real-time" environment where all the other member could also see what is going on and comment. The standard would be an ongoing work in progress, changing incrementally on a daily basis. For contractual purposes, a specific date can be selected for the revision to use on a specific project. I am sure that such a system would have its problems, but I think that it would probably solve more problems than it introduces. At any rate, those with the power currently to "tilt the playing field" in their favour will not want to jeopardise their power. Any change will be hard fought, and the politicians will be heavily involved, as their own power structure is eroded. We instinctively accept that laws and regulations are best made by the government. We vote for our representatives, and then feel that they will do the right thing regarding which laws to implement and ultimately to protect our freedoms. History suggests that this trust is probably misplaced. Below is a table from “Americans for tax reform”. 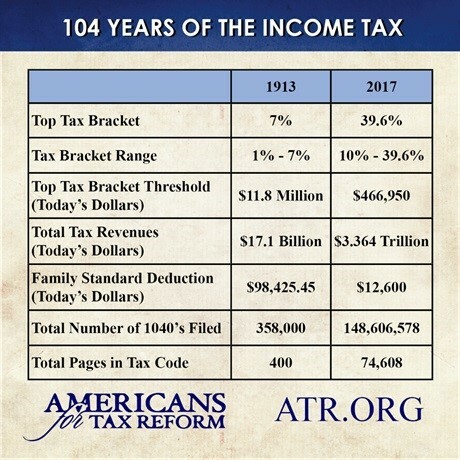 It gives a summary of how the American tax code has been changed over the last 104 years by those representatives that that were elected to ensure the freedom of the people. I am not picking on the American system. This picture will be rather similar all over the world, and not only in tax laws and regulations. Road traffic laws, trading laws, family law, food law, medical law, you name it, the picture will be similar. Governments and government organisations have introduced so many regulations that we are all breaking numerous laws every day without even knowing it. In short, the way that government regulation currently works is not ensuring the freedom of regular law abiding citizens. Rather, it is slowly enslaving us. Unfortunately, the current regulatory systems in place in most countries cannot curb the natural tendency for those in power to care for their own interests rather than serve those they are supposedly representing. As we discussed last week in The WelderDestiny Compass, when we looked at codes and standards, commercial organisations will do their best to use regulations to advantage themselves and disadvantage their competitors. As a rule, the small organisations and “little guys” will be the losers when big companies and industry organisations are involved in establishing regulations. While industry “self-regulation” sounds like a good idea, here too, history shows us that this is flawed. Many a scandal in the medical and financial arenas have shown us how companies and industry bodies have influenced regulations in such a way that their customers have been disadvantaged. In some instances, even killed and defrauded. Does technology provide us with a possible solution? Seeing as I used a negative example from the American system to highlight the problems with government regulations, I think it is only fair to start looking for a solution in the same place. Close to the end of the 18th century, the USA amended their constitution to include a bill of rights. A great many countries have followed their example. The normal gist of such a bill of rights is to place restrictions on the powers of the state to encroach upon individual freedoms. Would it make sense to have a “bill of rights” for protecting the “consumer”? I believe that we are getting to a point where the technology is in place to enable self-regulation by just about any industry. Instead of making it the state’s job to regulate, maybe we should be getting the industries themselves to regulate, but getting the state to monitor the process and enforce a “bill of rights” that protect the little guys, the small businesses, the individuals, the consumers. As we discussed in last week’s The WelderDestiny Compass, the system could be based on an open platform where anybody can raise their opinions and concerns. The role of the state would be to merely make sure that nobody’s individual rights are being infringed in the process. The exact legal basis and system is totally outside the scope of our discussion here, but I believe that the concept is something that will surely be tested at some point. You may think that this sounds like too much effort, and that it would not really touch your life. If you think this way, I think you need to reconsider. We have previously looked at what the typical Welder will look like in the not so distant future, and come to the conclusion that most of us will be "self-employed". Most of us will be the "small business" and "little guy". We are the one's that will need to be protected! The welding industry is highly-regulated. If such a democratised system is implemented, our whole way of thinking about our role in welding will be challenged. Not only will we be the one’s blindly following regulations with no power to influence them. As the people at the coalface, we have a good understanding for when regulations are unnecessary or ineffective and when they are needed and effective. I think that the future of regulation in general, and in the welding industry in particular, will shift in the coming decades. Probably a good idea to start preparing ourselves to be contributors when that time comes. In the last few decades, manufacturing has become very centralized. From the days of Henry Ford, the production line concept has driven manufacturing processes. In a production line, the drive is to reduce costs by maximizing the output of the production line. Economies of scale rule. Setting up a production line is very expensive, so you want to get as much out of a "production run" as possible, before you spend a lot of money and lost production time on changing the production line for the next production run of a slightly different product. Let's stay with our Henry Ford (motor car production) example. To set up a production line to produce a new line of automobile may be in the order of $1 Billion. In the "good old days" before production lines, the early motor car manufacturers would make each car as an individual "production run". In the early days, there were hundreds of automobile manufacturers and brands around. Every second guy that had a knack for working with his hands opened an automobile factory and built cars. Opening a motor car factory was not expensive, but the labour costs of building the cars certainly were. In the early years, cars were very much luxury items. This all changed with the production line invented by Henry Ford. Labour costs were drastically reduced, at the expense of production flexibility. You could get any colour model T Ford, as long as it was black! Manufacturing started becoming much more efficient, as long as the "production runs" were big enough. For many manufactured articles, the costs associated with transporting, marketing, warehousing and retailing are significantly higher than the original production costs. The production dynamics associated with robotic manufacturing will greatly change the economics once again. Instead of huge factories with machines that have dedicated production functions, robots have the potential to revert back to the earlier model. In the robot model, a "robotic cell" manufacturing platform can be installed in a relatively small space and almost everything that is needed to build the car can be done by a few robots, at the same time. As long as the designs and raw materials are available, the robotic cell can really make any model car required. (Again a simplification, but you get the idea.) Each production run again becomes a production run of 1. Imagine the automobile industry of the future: You walk into the "dealership" and select a model from a virtual reality catalogue. (or you could order it from Amazon on-line if you prefer) This could be a Ford, Honda, Toyota, or whatever "brand and technology provider" that dealership has a contract with. You are told that in two days the car will be delivered to your door. As you leave the dealership, you glance through the glass wall at the back of the dealership and you see the robotic cell starting to make your car. You stand for a couple of minutes, transfixed by the rapid movements of many robotic arms manipulating materials, welding panels together, moulding plastic components, 3D printing other components, machining little "widgets" needed who knows where. The quote may seem out of place, but the principle being described is exactly the same as population growth. To illustrate, let us look at the current human population of 7.5 billion people on earth. If we assume a population growth rate of 5% per annum, (it is currently much lower at 1.1%, but for illustrative purposes we will use a higher growth rate) then the world's population will double every 14 years or so. In 2027 there will be 15 billion people, in 2037 there will be 30 billion people, in 2047 there will be 60 billion people, in 2057 there will be 120 billion people... I am sure you get the picture. Mathematically this compound growth must eventually end at some point in time. If we project this time out far enough, then there will eventually be more people on earth that there are atoms in the universe. Clearly not a possibility. Clearly we will also run out of resources here on earth long before we get to any such number of people on earth. Well, in many advanced economies, the population growth rate has basically come to a standstill. In fact, in many countries the population growth is negative. In those countries where population growth is still positive, this too will eventually reach a zero growth, or even a negative growth rate. This is not some far sighted prediction, it is merely a matter of mathematics. In other words, what can't sustainably continue, will eventually stop happening. Populations clearly cannot continue growing forever, so eventually this growth will cease! The economic model on which most economies have been based for the last 50 years or so, has been based on economic growth. This economic growth was largely based on population growth and credit growth. Neither of these can continue indefinitely. When populations start to shrink, then the number of economically active people compared to the "retired" people start to fall. In other words, we get an ageing population. Japan has been trapped in this demographic trend for decades, and their economy has basically "stalled". While it is possible to compensate for this by exporting products to nations that are still growing, clearly this strategy itself has a shelf life. Retired people do not buy new houses. Retired people do not spend a lot of money on education for their kids, or anything else for their kids for that matter. Retired people do not take out big loans to start up businesses. In short, as the population shrinks and ages, there is a lower demand for many products. The economy in general slows down. The only sector of the economy that increases is the aged care sector, which would include healthcare. Obviously we all, including all old folks, also need to eat! At the same time, there are fewer economically active people to do the work that needs doing. A lot of the work that is done will be in the aged care and associated services sectors. So, while there is a lower demand for products, the economically active population will start being "stretched" due to the demand to support an ever increasing aged population. A point is reached where there seems to be a shortage of workers to do everything that needs doing. Not enough people for all the jobs?? Another argument that is often raised, is that with automation, the higher paying manufacturing jobs are taken away, and the lower paying service jobs remain. These lower paying service jobs are typically jobs like serving in restaurants or other retail environments. The environment in which it needs to be done is unpredictable. Typically maintenance or construction type scenarios. In-process problem solving is an integral part of the job. Human workers are not replaced just because they can. Human workers are replaced where it is more cost effective to use machines. We also need to understand that not all workers are created equal. Within a field such as welding, there is a lot of skill involved. Just like not everyone can become a great singer or athlete, so not everyone can become a great welder. As with any other field, there is a "talent factor". Some people will never become great welders, regardless of the amount of practicing they do. Also, where skills are involved, practise and experience are definitely deciding factors. If you have been welding for 10 to 20 years, you will in all probability have a higher skill level than somebody that has been at it for less than a year. In short, jobs where humans are employed will need to be highly productive, to make it unattractive to spend the money on the machines. Typically high productivity is associated with highly skilled and experienced workers, not with newbies. People's inability to find work may have more to do with them not being able to successfully exploit appropriate niches rather than a lack of work per se.